Into Scandavia country to work with family ministries at North Sea Baptist Church. This church is affiliated with the International Baptist Convention, a grouping of independent churches that minister primarily to ex-pats and military families stationed throughout Europe, Asia and parts of Africa. I initially met Pastor David Fresch at Interlakken, Switzerland at the IBC Convention in 2014. Besides his pastoral ministry at the church, David also has is own ministry called “Fresch Ministries International” that does leadership training for churches around the world. David is also very involved in the leadership of the IBC. It was great to spend the week hearing about his passions and plans and visiting with his family. This picture was taken at the Three Swords monument by the sea. 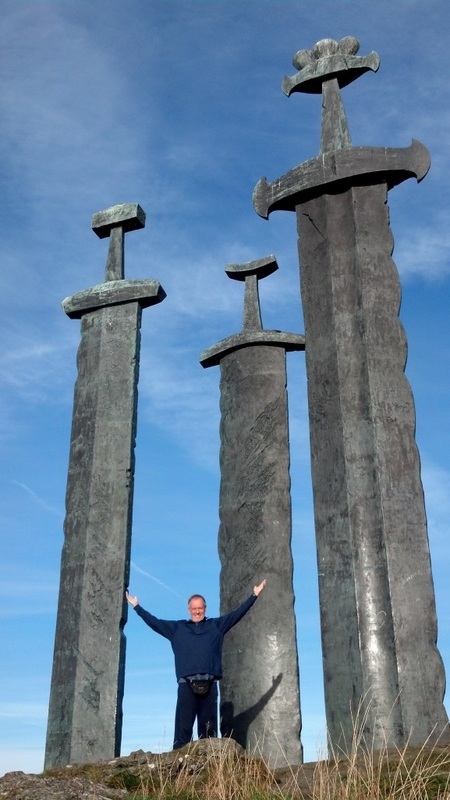 The commemorate the historic Battle of Hafrsfjord that took place there in the the years 872 when King Harald Fairhair gathered all Norway under one crown. The weekend training event was held in Stavenger for the whole family. The event was coordinated by Jennifer Wells and her husband Todd and other members of the children’s ministry team. Todd is an ex-pat working with a local oil company and temporarily stationed in Norway with his family, as are many of the others in the church. The weekend was very unique in that the experience was developed for families to spend the weekend together in worship, training, fellowship, and community. Besides three training sessions, there was also Olympic-styled family games and fun contests. You can see by the picture below that the experience was very intergenerational. The week included a day trip into the inland fiords of Norway. Had a glorious day with tour guide (Captain) Kirk, a TRUE NORWEGIAN, who flies for Norwegian Airlines and is the men’s ministry leader at the church. This is a picture taken at Pulpit Rock, one of the most glorious stops and sites in Norway. Thanks for a great day, Kirk!